Taipei, June 2 (CNA) Taiwan Taoyuan International Airport was left in a state of chaos Thursday due to severe flooding, power outages and computer glitches in the wake of a thunderstorm. According to Taoyuan International Airport Corp., the airport's computer system broke down due to overheating after power outages caused by the thunderstorm forced the airport's air conditioning system to shut down. Manual immigration clearance was adopted for arriving passengers as a result, which severely slowed down the process. Also, flood waters brought by the heavy rainfall severely inundated the airport's basement food courts and parking lots as well as underpasses connecting the airport to National Highway No. 2, leading to massive traffic congestion and delays in areas around the airport. As an alternative, vehicles heading to the airport were directed to take National Highway No. 1 instead and then change to Provincial Highway No. 4 after getting off at the Taoyuan Interchange. Fei Hourng-jiun (費鴻鈞), chief executive officer of Taoyuan International Airport Corp., said the airport has learned a big lesson from the thunderstorm, promising that his company will improve the airport's flood prevention facilities and transport system to prevent similar incidents in the future. 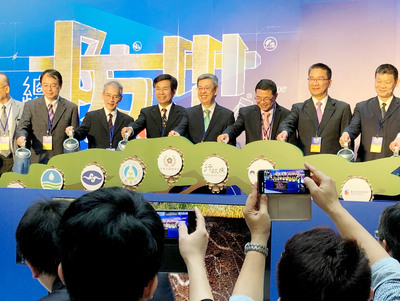 Transportation Minister Ho Chen Tan (賀陳旦), meanwhile, said the airport should learn from the experience and should strengthen its weak points and take immediate steps to solve problems in the event of a flood in the future. Also Thursday, Presidential Office spokesman Alex Huang (黃重諺) said President Tsai Ing-wen (蔡英文) was very concerned about the airport's situation and has directed the Cabinet to coordinate with the relevant agencies to help rectify the situation.